Abby is also wearing Dura girl (54) hair, MyUglyDorothy skin and slink feet. I like the idea of a creative challenge, and this is my first Arcade event. 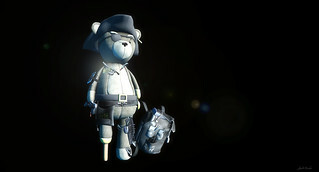 First I went for the gamer geek items on a pirate bear, but I realized that you do not only need to show 5 products, they have to be from different creators. Somehow loved how the monster chairs looked. Made a few pics of these for fun with Abigel. She is a great, innocent and wild girl, her style fitting the plushies perfectly. In the end I could trade a few items and got a rare UFO. From there I just needed to put them together and the picture sort of made itself. I love the expression and the crazy style. Decided to go with plain black background, something I am experimenting these days. Simply puts the focus on the subject and the lighting effects get more attention. Also, fits the space theme. These are all great quality products, awesome fun to work with! Thanks for the creators and the event for this experience, preparing the image was great fun.